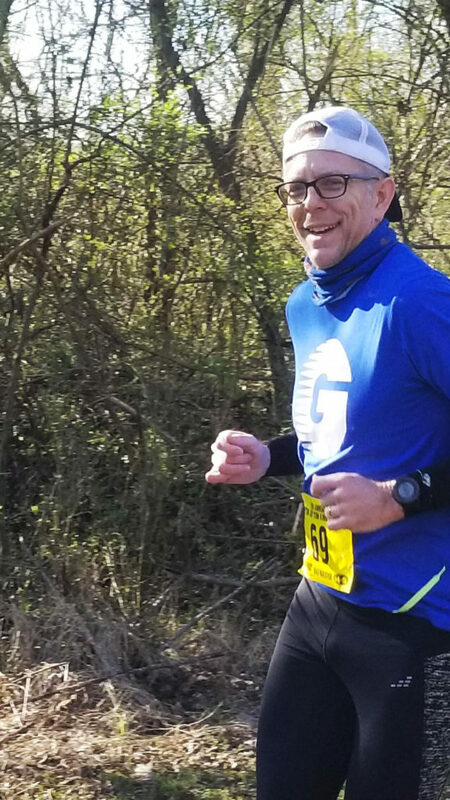 This is my third time in three years running Tom King Classic half marathon presented by Gupton Jeep with Nashville Striders. The 2016 event was my first half marathon since 2013, and I set a personal record for this distance by just over four minutes. Having only run consistently for six months prior to that event, those results were gratefully acceptable, and it set a baseline goal for future half marathons, albeit a flat one. The 2017 event was also my first half marathon since the 2016 event, though I had raced a trail “half” (which was 12-ish miles) two months earlier; however, in an effort to ramp up racing distances, Tom King 2017 was an A-race for me, complete with training goals to run faster than previous year. Thanks to some great coaching, a forbearing family, and some great running buddies, I set another half marathon personal best by over eight minutes. Even so, a personal best is a personal best. Regardless of how painful or ugly it was. Grateful for that progress. For 2018, I somewhat reluctantly entered this race. Having done it twice before, repeating a third time wasn’t a priority for this variety-loving guy. Plus, I’ve completely fallen in love with trail running so my most-recent road race was way back in October 2017. Plus, my training schedule and sleep quantity/quality has been sparse due to preparations launching a personal project (a podcast that I hope you’ll subscribe to). Instead I challenged myself to “simply go, run the race, and enjoy the opportunity to be able to run in the first place” instead of challenging myself with pursuing another PR. This was itself a challenge because of this competitive bone I have, but it was an achievable goal given the wee bit of enthusiasm for a flat road race. This became an opportunity to see if my aerobic base would carry me through the morning despite the not-exactly-wise-during-race-week schedule of a bazillion squats and lunges (all directions) on Wednesday, then a brisk three miles to blast off the Huntsville chapter of Moonshine Runners Society on Thursday, then some easy rolling four miles or the Nashville full moon on Friday the night before this race–and, yes, I know this is becoming a really long sentence disguised as a paragraph–it’s time to toe the line and treat this like the long, third leg of a Ragnar event or the 11th hour of a 12-hour race to see what was in the tank and behind the throttle. Who needs proper preparation, taper, and recovery before a flat half marathon road race, right? Commence bagpipes, pop goes the start pistol, and off we go. My plan was to enjoy the day, see how I felt, and fuel or hydrate at each water station without splashing myself, or those around me, by walking through the water stops to give my legs a break, like I would do in a trail race. Steady eddie for first five miles, chug some water, walk a few paces to loosen up a bit, and repeat steady eddie through the turn-around until the next aid station at 7.5 miles. There I walked a bit more, chatted briefly with my friend John Shafer (who really needs to join us on a moonshine run…eh hem) after sucking down that synthetic yellow liquid replenishment and vanilla bean sugar gel in an attempt to stave off my previous mile-9 wall which was becoming a mental road block. Here I was ticking along at a 7:58/mi pace which is faster than my current half marathon PR. Good to know. Just keep it steady eddie and enjoy the morning sunshine. When I reach the mile-10 water station, I again walked a few steps whilst wondering if I made it through/over the elusive 9-mile wall. Felt “just OK” physically and was kinda done with the flat terrain and incessant cruise control. Perhaps I could have thrown in some strides and surges, but nah…that’s what “racing” is. This was a run date at a race event. At the last aid station with ~1mi to go, my average page slowed to 8:08/mi, and I knew I was close to matching or slightly beating my half marathon PR, and I was definitely ready to be done with this road half. Have I mentioned that it’s painfully flat? Woefully flat for this hill-loving trail runner? Even so, gorgeous morning, and I’m healthy enough to get this far so let’s knock out this last section. Stepped on the gas a bit because that’s what you do at a race (this became a race to me by this point), but there was only a mild speed surge. Body and mind were feeling the week before so we’ll do what we do. Finish line is a matter of minutes away. Round the final turns and open up a bit, knowing that finish is literally in sight. Cross the line, stop the watch, then quickly beeline to the water and food station. I was rungry. For sure. Finish time was 1:45:39…one second slower than my half marathon PR. Remember those walk breaks? Remember not surging harder? Ah well. It is what it is. And what it is is a 1:03 faster time on this woefully flat road half marathon course as a one-year-older person and an off-my-PR-by-one-second effort for an event for which I was ill-prepared during which I gave a “whatever” effort. I’ll take it. Definitely a great day to be alive. Looking forward to some trail races.